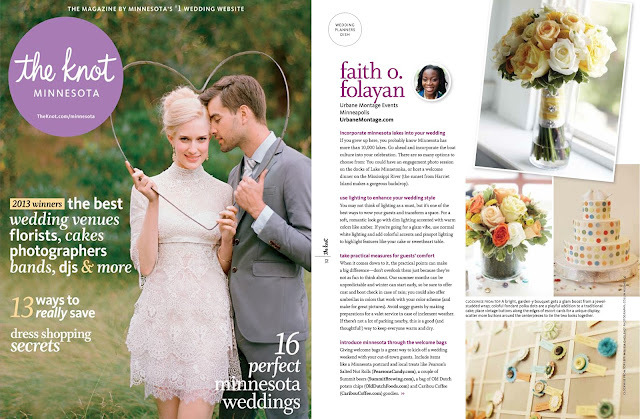 I'm so excited to be featured in The Spring/Summer 2013 issue of The Knot Minnesota Magazine! Check out the Wedding Planner Dish section on page 32, where I share helpful tips to planning a Minnesota wedding. I couldn't be more thrilled to have Jessica + Ryan's button inspired wedding with images by Collin Hughes Photographs featured as well. The issue is on newsstands now, so be sure to pick up a copy! It is also a HUGE honor to be voted by Knot brides as The Knot MN Best of Weddings in the wedding planning category! My team and I are truly humbled and thankful to have our wonderful couples vote for us. We can't THANK YOU enough!